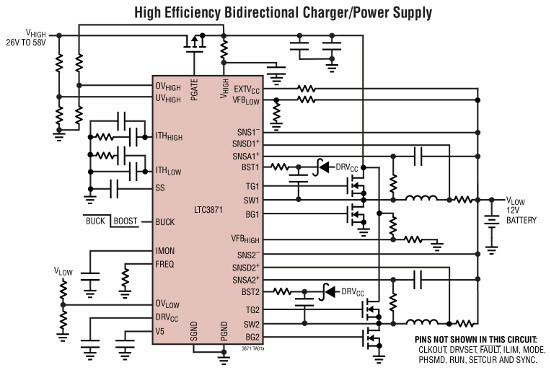 The LTC3871 operates in buck mode from the 48V bus to the 12V bus or in boost mode from 12V to 48V. Ideal for automotive dual battery systems, Linear Technology's new 100V/30V bidirectional two-phase synchronous buck or boost controller provides bidirectional DC/DC control and battery charging between the 12 and 48V boardnets. Current 12V automotive systems are reaching their 3kW power limit due to the ever-increasing demand for more electrical devices. A newly proposed standard, LV148, combines a secondary 48V bus with the existing 12V system. The 48V rail includes a belt starter generator (BSG) or an integrated starter generator (ISG), a 48V lithium-ion battery and a bidirectional DC/DC converter for delivery of up to 10kW of available energy from the 48V and 12V batteries combined. This technology is targeted for conventional internal combustion automobiles, as well as hybrid electric and mild hybrid vehicles, as auto manufacturers strive to meet increasingly stringent CO2 emissions targets. “Running a portion of a vehicle’s electrical system at 48V will play a central role in increasing available energy, while reducing wiring harness weight and losses. This additional energy capacity paves the way for new technologies, enabling cars to be safer and more efficient, without compromising performance," said Don Paulus, VP for power management products, Linear Technology. The LTC3871 operates in buck mode from the 48V bus to the 12V bus or in boost mode from 12V to 48V. Either mode is configured on demand with an applied control signal. Up to 12 phases can be paralleled and clocked out-of-phase to minimize input and output filtering requirements for high current applications (up to 250A). Up to 3kW can be supplied in buck mode or in boost mode with a 12-phase design. When starting the car or when additional power is required, the LTC3871 allows both batteries to supply energy simultaneously by converting energy from one boardnet to the other. Typically, the 12V bus will continue to power the ignition, lighting, infotainment and audio systems. The 48V bus will supply active chassis systems, power steering, air conditioning compressors, electric superchargers/turbos and support regenerative braking. Up to 97% efficiency can be achieved and the on-chip current programming loop regulates the maximum current that can be delivered to the load in either direction. Four control loops, two for current and two for voltage, enable control of voltage and current on either the 48V or 12V boardnets. The LTC3871 operates at a selectable fixed frequency between 60kHz and 460kHz, and can be synchronised to an external clock over the same range. The user can select from continuous operation or pulse-skipping during light loads. Additional features include overload and short-circuit protection, independent loop compensation for buck and boost, EXTVCC for increased efficiency, ±1% voltage regulation accuracy over temp, along with undervoltage and overvoltage lockout. The LTC3871 has been qualified to meet AEC-Q100 specifications and was designed with intrinsic safety being fully considered in line with the ISO 26262 standard. The LTC3871 is available in a thermally enhanced 48-lead LQFP package. Three temperature grades are available, with operation from –40°C to 125°C for the extended and industrial grades and a high temp automotive range of –40°C to 150°C. The 1,000-piece price starts at ₹362.10 ($5.40) each.